About a month ago Moose's Retro Cafe opened up in Goshen, NY. Moose's Retro Cafe took over the space formerly occupied by Big Dave's BBQ. The inside has been remodeled to give the restaurant a retro feel to go along with their retro theme. There is a large display case in the restaurant featuring the type of memorabilia and decor you would have found in your old school diners/cafes. The menu features diner classics with a modern twists. 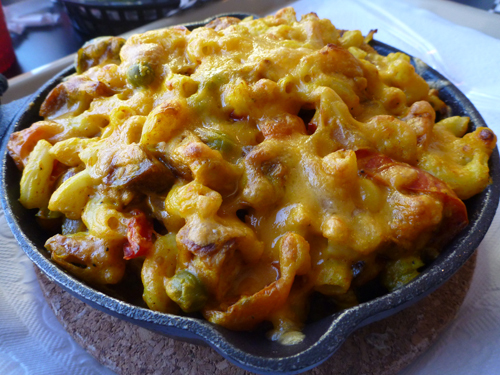 Start off with one of their homemade Mac & Cheese Skillets. You can choose from 9 different options including the Classic (Cheddar & American cheese) or the Spicy Chicken (grilled chicken, hot sauce, cheddar & gorgonzola cheese). Not in the mood for Mac & Cheese, get one of their stuffed burgers or a Moose's signature hot dog. If you look hard enough at the menu you will see that Moose's offers a Tijuana Dog. This is a hot dog wrapped in bacon and deep fried. See Crif Dogs is not the only place doing this, the deep fried hot dog is making it big every where. Also available are sandwiches, salads, wings and a variety of specialty grilled cheese sandwiches. No retro cafe would be complete without your classic diner/cafe drinks and Moose's has them all. You can choose a classic milk shake, a soda float or even an egg cream soda. An egg cream soda is a mixture of milk, seltzer and chocolate, vanilla or strawberry syrup. You can also get a Cherry Lime Rickey. With so many options we were not sure exactly what to get, but we heard good things about the burgers so we decided to go with the Jalapeno Jack burger. The Jalapeno Jack is stuffed with jack cheese, jalapeno peppers and topped with lettuce, tomatoes and onions. This was hearty burger made with ground chuck beef. It was cooked perfectly and was very juicy. You can also see all the layers above with the jack cheese and peppers dripping out of the middle. One of the best things about this burger is the brioche bun. Besides quality meat, there is nothing in our opinion more important to a good burger than the bun. The brioche bun is a perfect choice to house this burger. It was freshly made and was big enough to soak up all of the wonderful burger juices without becoming soggy. This was a quality burger and we would definitely come back again. The burger itself was so filling we were not even able to finish all of our meal, though we did eat the entire burger. We also ordered some of Moose's fries. The fries were hot and well seasoned. They serve homemade hand cut fries. They are the type of fries that still have some potato skin on them. This type of French fry is not our favorite but these were cooked just right. If you like hand cut fries you would really enjoy these. Update: Make sure to check out our Moose's Update below, we went back and tried some more items. Moose's Retro Cafe offers Goshen a nice new spot to get diner/cafe classics. The restaurant is very clean with a personable staff. The food is made with quality ingredients and served quickly. The menu has so many options it will take more than one visit to try everything Moose's has to offer. Moose's Retro Cafe is a Should Eat. We plan to go back very soon to check out the other options they offer, and we will be sure to update you on what we find. We have our eyes on one of their Mac & Cheese Skillets next. We made a trip back to Moose's the other day to try out some of the other things they offer. Spicy Chicken Mac n' Cheese: Grilled chicken breast with hot sauce and Cheddar Cheese topped with Gorgonzola crumbles. Cali Dog: Diced Avocado, onion cucumbers, tomato and parsley. We had another good meal at Moose's. We started with the Cherry Lime Rickey which is similar to Sonic's Cherry Limeade (one of our favorite drinks). It was very sweet, as to be expected with cherry syrup added to the sprite. We would have liked to have had a bit more lime flavor coming through, the cherry syrup really took over this drink. Kids will definitely love this drink. We needed to get the Cali Dog, it sounded so good. You can get all of Moose's hot dogs either deep fried or cooked on the grill. If you have been following us you know that we opted for the deep fried version. Like their burgers, Moose's hot dogs come on a brioche bun, which is a nice touch and big enough to hold in all the toppings. The dog was fried to perfection and had nice snap to it. The toppings which reminded us of a salsa were all very fresh and the inclusion of cucumber was a first for us on a dog. It was very tasty, but we would have liked there to be a bit more seasoning added to the "salsa" or just a squeeze of lime juice. In the end we will be back for some more Cali Dogs. We followed up the Cali Dog with a duo of Mac n' Cheese. Both were cooked in their own cast iron skillet and had a nice cheesey crust. The pasta itself was cooked to the perfect consistency. True to its name, the spicy chicken was really hot. If you do not really like spicy food, steer clear of this Mac n" Cheese. If you can handle the heat, order this next time you go to Moose's. The paella was packed full of sausage and shrimp. It was the most unique Mac n' Cheese we have ever had. All of the ingredients worked well together and actually tasted like you were eating paella. If your a fan of paella, then this could be your go to Mac n' Cheese moving forward.